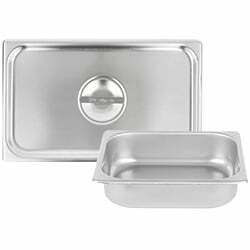 Explore our array of stainless steel steam table pans and hotel pans, which includes a variety of sizes and styles. When it comes to keeping your food hot and safe from contaminants, these steam table pan covers are the right tools for the job. Store small quantities of cold ingredients in these stainless steel deli pans and keep them secure with accessories such as lids. These steam table water pans help keep your foods at safe serving temperatures for hours by evenly distributing steam heat. 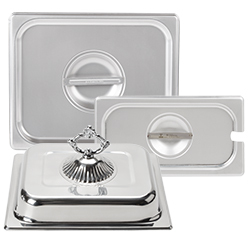 Elevate the appearance of your offerings through use of decorative steam table food pans, including oval, casserole dish, and wild pan shapes. Products like steam table adapter bars, false bottoms, and pan liners are all important accessories for a complete steam table setup. 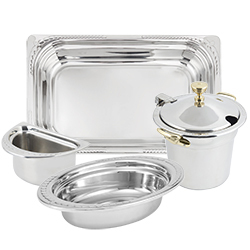 You'll love our wholesale selection of stainless steel buffet pans and accessories. With several different heavy weight, standard weight, non-stick and regular stainless steel pan models to choose from, you're sure to find the perfect stainless steel bakeware for your restaurant. Pick up some divider bars, false bottoms, and pan covers for further customization. Best of all, these fractional steam pans are all made of easy-to-clean, attractive stainless steel. 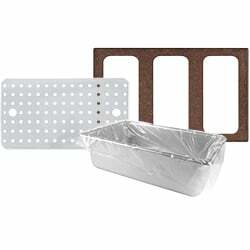 We carry all sizes, thicknesses, and shapes to best fit your steam table setup. Perfect for caterers, cafeterias, buffet lines, and other hot food serving applications, a stainless steel steam table pan is a versatile, essential piece to any commercial food service application. If you're wondering where to buy stainless steel steam table food pans and accessories, we have a large selection of stainless steel steam table food pans and accessories for sale at the lowest prices. 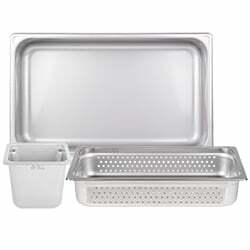 Food pans are used in every stage of the food preparation and presentation process. But from assembly to display, the types of food pans that restaurateurs and caterers use are not all created equal. That's why understanding the differences between these pans, and therefore determining which pan is best for your needs, is vital to the success of your operation. Use this guide to learn all you need to know about the food pans designed to best meet your needs. 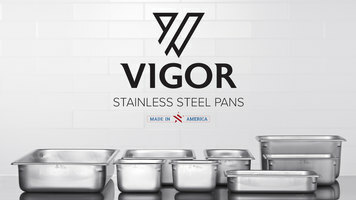 Vigor produces durable and reliable steam table pans that will outlast thinner alternatives! They offer excellent protection against dents and dings, and help to conserve energy by preventing steam from escaping. What are steam tables? They're used by caterers, hotels, buffets, cafeterias, and anyone else who needs to lay out a delicious spread of hot food to serve a crowd of hungry guests while maintaining safe hot food temperatures. These tables hold hot food at ideal serving temperatures throughout meal service by way of either moist or dry heating, depending on whether or not water is used in the pan or well above the heat source. The popularity of steam tables among people in the foodservice industry has helped to grow the market, and thus, there are dozens of different styles to choose from to fit your culinary and budgetary needs. Increase the versatility of your commercial steam table set up with a stainless steel steam table pan. 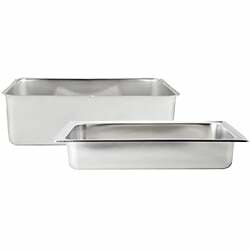 Also known as hotel pans, gastronorm pans, fractional pans, steam table pans, and stainless steel pans, these come in a variety of sizes, thicknesses, and types. Choose from solid, perforated, and non-stick stainless steel pans to suit your unique food preparation needs. We also carry several sizes of stainless steel pans that are great for your steam table. Our fractional stainless steel pan sizes allow you to mix and match for the perfect stainless steel pan configuration to fit your restaurant's needs. This way, you can customize your table to use pans that work best with your menu items. We carry various stainless steel gauges, so you can find the perfect steam pan thickness for your operation. To determine which gauge to purchase, note that the lower the gauge number, the thicker the steel. High-volume kitchens should purchase pans made with lower gauge steel, whereas low-volume kitchens can choose high gauge steel pans for lighter use. Also, check out our decorative pan options for a unique style that is perfect for your next catered event. Choose from heavyweight, standard weight, non-stick and regular stainless steel pans. We carry several sizes of stainless steel pans, perfect for your steam table. Our fractional stainless steel pan sizes allow you to mix and match for the perfect stainless steel pan configuration to fit your restaurant's needs. This allows for a flexible, versatile cookware operation. Customize your table to use steam table pans that best fit your menu items. We carry various stainless steel gauges, so you can find the perfect steam pan thickness for your operation. We even have pans that can stand up to a high-volume, heavy use environment. For a lustrous, shiny display at your next catered event, try our 18/8 stainless steel mirror finish metal pans. We also carry economical hotel pans to suit any budget. Don't forget to check out stainless steel pan accessories as well! We carry adapter bars for your fractional pan display, steam table pan liners, water spillage pans, deli pans, sneeze guards, overshelves, and hundreds of other hotel pan products.